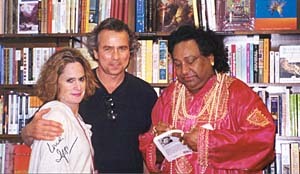 Ifti Nasim has gotten in trouble for his writing ever since he was growing up in Lyallpur (now Faisalabad), Pakistan. It started when he was 16, at a protest against martial law. He was standing at the lectern, reading a politically charged poem. Suddenly the auditorium doors flew open, and a soldier shot him in the leg. Someone pulled him out of the way before he caught another bullet. "I put a cloth on my leg and went home," says Nasim, 53. "I didn't tell anyone. The next day my sister came into my room and saw blood all over." The wound became infected, and he was bedridden for six months. The ordeal ruined a promising career in classic Kathak dance, which relies on intricate footwork. But it did nothing to diminish his budding activism. "When my parents found out, they were very upset," he says. "They told me not to demonstrate. Of course I didn't listen to them." But that was the least of his worries. Nasim had known from an early age that he preferred men to women, but he had learned to keep it under wraps. "I could not tell anyone that I could not be with girls - that I liked them so much I wanted to be one," he says. "In Islam you can never be a homosexual. You might as well be a dead person." His parents arranged a marriage for him. "I did not want to live a double life," he says. "I did not want to leave a wife at home and go out and pick up guys. I thought that was a dishonest way of living." He'd read a Life magazine article that showed "gay people living happily ever after in the U.S." and talked his father into bankrolling a three-month trip to America. The months turned into years. He enrolled at Wayne State University in Detroit, continued to write and worked to bring the rest of the family over. He'd assumed his sexuality was a passing stage until he moved to Chicago in 1974 and into the thick of the gay disco scene. "At first I was afraid to go into a gay bar," he says. "But I went in. They were the nicest people on the planet earth. I said, What the [heck]-why haven't I been here before? It was a non-stop party; I loved it." He also saw some terrible things, such his friends' getting beaten up and robbed by homophobes. "I couldn't believe my ears and eyes," he says. "What had happened to the Life magazine story? But the gay liberation movement was on, and I joined." When he wasn't selling cars at Loeber Motors (he quit several years ago to write full time, but still drives a gold Mercedes), he wrote poetry in Urdu, Punjabi and English, and continued to hit the clubs. In his poem " A Car Salesman Blues," he writes, "My show room is my stage and / I have a stage fright. I am smiling now but my ulcer is flaring up / One more rejection and I shall fall down / Like a mud wall in the rain." Nasim, who favors fur jackets and ample jewelry, has written three books of poems in Urdu that deal with the ostracism of homosexuals in Third World countries. 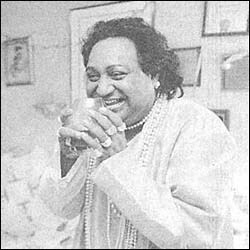 The most popular, "Narman" (it means hermaphrodite in Persian), was distributed underground in India and Pakistan and sparked a movement called narmani, or honest poetry; While spawning an awareness of gay rights, it also earned him death threats from religious groups. 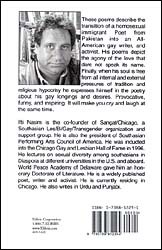 In 1986 he co-founded Sangat/ Chicago, a South Asian Les/Bi/Gay/Transgender organization and support group that takes its name from the Sanskrit word for togetherness. "They're lost when they come here and find out they're homosexuals," .he says. "They are a minority within a minority." That work got him inducted into the Chicago Gay and Lesbian Hall of Fame in 1996. But his frankness about his sexuality has alienated the family he brought over from Pakistan, with whom he has an uneasy truce. "My family isn't my problem anymore," he says. "I guess I'm their problem." 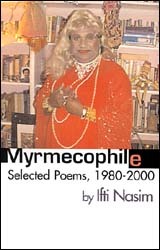 He doesn't plan on showing them his new book, "Myrmecophile: Selected Poems, 1980-2000" (Xlibris, 2000), the cover of which shows him in an over-the-top drag getup. (a myrmecophile is defined as an insect of a foreign species that lives more or less permanently in an ant colony;) Its personal and political poems are laced with humor and outrage and touch on everything from pedophilia and homophobia to Princess Diana and the nature of God. When he's not working on a novel set in the disco era, Nasim pens a weekly column for the Pakistan Express newspaper. In it he's been critical of Muslim policies toward women and homosexuals. "I'm basically a Muslim person," he says. "I don't practice. But I compensate by helping other people, by doing my activism, But I don't think activism should be extreme, either." His work inspires extreme reactions, On March 12 Nasim was at a restaurant near his Rogers Park apartment when a Muslim I man called him an "abomination" and allegedly threatened him with a knife. Nasim pressed charges. He can't discuss the incident -the court date is May 1- but Nasim says the notoriety surrounding it has deflected attention from his book. "The issue of my being a serious writer is being overlooked now," he says. "I don't like it. But in a way I'm relieved "that people are noticing finally the structure we put into place [in past decades] for gay and lesbian rights. We are seeing the results now. We are standing up for our rights. In a different time I would have walked away; Now I refuse to do that"